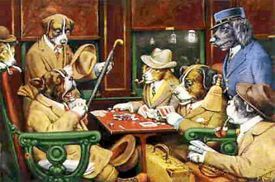 I realise that I'm new to this forum, instead of hosting a journal of sorts on Blogspot, wordpress.org; I'd rather post my poker journal entries here, simply cause I'm tired of maintaining my own blog. What's the story so far? I dropped 4 buy-ins in 6-max 100NL, took most of it to 2000NL and donk it off in true donkey short-stack fashion, with QQ on an Ace high flop. Did I feel remorse? Hell no! I should have done that earlier! All I felt was calm and everything sort of clicked together. I switched off my laptop, took a nap, woke up the next day feeling... fresh and started to rebuild whatever that is left of my bankroll. Where I'm at now? 10NL 6-max, 4 tabling at pacific without pokertracker. Starting bankroll $250. After about 2K hands over the weekend, I'm at $420 now. Yes, I'm running hotter than God now, expecting Pacific poker to turn on my Doom-switch any moment now. Have about $60 in Bodog RB, waiting for it to clear, planning to purchase pacific hand grabber with that. My short term target: 50NL by the end of the year, with a 1K BR. I realise I'm using very aggressive BR management, but I think I'm ready for the swings this time. Next year March, I hope to put together a 3K BR to challenge the 100NL again. Don't have Pokertracker for my stats, but I figured I'm playing a little LAGGY, cold calling 4xbb raises, since the players at that limit will pay off on a coordinated board with their TT+, AT+. It's looking good, but I'm left with 2 months to attain my goal of $1K. Plus, I'll be holidaying in Vietnam for 10 days next month, I think I'll have to work doubly hard to clock the number of hands required. Again, without PT, it's quite hard to track my stats and results, but I have confidence that I'll be able to hit my target if I'm able to put in 25,000 hands at 10NL and 25NL before the end of Dec 2007. P.S. Whether I succeed or fail in reaching my goal of racing to $20K next year, I'm going to be keeping records here; to keep myself honest about my results. Whats ya username in pacific? i am there too, clearing bonus. mine is deadaxi, playing 50 PL omaha Hi most of the time. They do not have 25 PL there and they dun have my fav Omaha H/L. Well, i will just stick to Hi until i clear my bonus and leave pacific for good. I hate that place (wonder why you love it so much). maybe when i bump into you, i will say hi!! ChanGs wrote: Whats ya username in pacific? Hey Chan, my username's secret... cause when I created my username in the past, I used my real name, hope you understand. I'm perfectly fine with giving out my username, but this time round, I made the mistake of using my real name. I'm not that comfortable giving out my real name online. The reason why I love pacific poker, if you strike TPGK and above, you can felt it, knowing that someone is going to call you down with bottom pair. Of course, you get sucked out once in a while, but the players there are so passive, it's easy to know when they're holding the nuts. haven't been playing much the last few days, maybe around 1200 hands? Got coolered from left and right. Doesn't really matter, cause I made back more from betting and raising my good hands. I'm about 1 buy-in away from 25NL. Something I learned about the players on Pacific --they are so passive. They'll overbet with the 2 pairs and above. That kinda make my decision-making a whole lot eaiser. it's hard to fold pocket rockets, cowboys nonetheless, but I'm trying to break that habit, knowing when I'm beat. At some point, my BR dropped to $410... but that's easily remedied. Just had a good session. Made a questionable call. I called, knowing that he probably has a Queen... I'm drawing dead if he's holding QT, but as he raised preflop, figured that he's holding something like AQ, KQ. Pretty narrow range, but it's pacific poker y'all know. Onwards to 6-max 25NL!!! Just crossed the $500 barrier, all within 10 days! I'm so proud of myself. Still, I guess I won't be able to play poker for at least 11 days, starting from 1st of Nov till 11th. going for a holiday in Vietnam. After I'm back, I'll have about 50 days to clock 20,000 hands, and clear the $1,000 mark. I think I'll be playing 6-max 25NL on Cake Poker, since I have 33% RB over there. You can't use poker tracker over there anyway, so it'll be like playing on Pacific Poker. Leaving Pacific Poker, finished clearing bonus, see you soon donnylucky. Hey Chan, I'm still here. Leaving only on the 1st of Nov. Played about an hour, 4-tabling 25NL 6-max. Session started off bad, lost a buy-in with AA vs a set, AJ vs AQ... The session improved towards the end. I raise to $1.00, SB folds, BB calls. Alright, I put in another 50 hands during lunch hour at work. I know, bad bad boy. Anyway, won a whole buy-in with the almighty 86o on the big blind. Woohoo! Looks like it's going to be a breeze, if my lucksack holds out for the next two months. Pacific poker's waiting to flip my doomswitch anytime now. P.S. See ya guys in a November. Nice progression for the month of October. Let's hear more from ya in Nov.
Good luck in your games dude. Thanks DM. Hopefully I won't tilt off a bunch of chips again. I think I'm running a little too hot. I dread the cold deck that's inevitably coming my way. Anyway, that's for the month of Nov. Let us GOgogogogo!! Just got back from Vietnam, nice trip... Saw lots of things that makes me appreciate the fact that I'm living in Singapore. The traffic is horrendous. Anyway, I wouldn't be playing too much for this month, I'll try and slot in a couple of hundred hands as and when I can. Anyway, I played about 3 sessions since I got back, poker didn't change much since I was gone... Got sucked out a few times, made a few 3-barrel bluffs, got called by the Villain who was holding bottom pair. KK vs AA, I shove to a 3-bet, turn rescued me with a King... Lucksack... I'm such a Donk. Still, my lucksack seem to be holding well, after about a thousand hands, I'm up more than 2 buy-ins. Not too shabby... I sucked out a few times anyway, which made me think that my game is far from perfect. Still making the same old mistakes of bluffing the unbluffable stations, calling with SC out of position, taking this week off and rethink certain things and poker strategy. I'm on the Button with KK, 3 Limpers, I raised to 7xbb, got two callers. (I have about 150BB, Villain has about 100BB). Villain donkbets 25BB, I called and the rest folds. Villain bets 50BB, at this point he has about 35BB or so left, I have him covered. The board is looking really wet, and I SHOVED!!! What's your play? And what range do you put the Villain on?